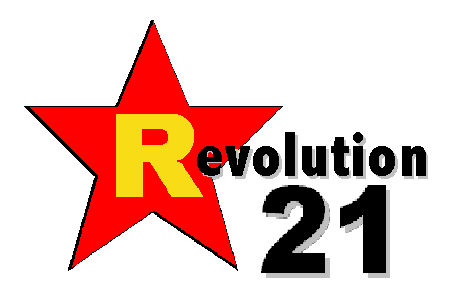 Revolution 21's Blog for the People: Now if it had been Krispy Kreme. . . .
Hurricanes can't shut down Waffle House. What's a little wind and rain? Hell, for all I know, nuclear war and/or the Apocalypse couldn't keep the legendary short-order chain from scatterin', smotherin' and coverin' the hash browns . . . and probably anything else you desired. If hostile space aliens mounted an invasion of Earth tomorrow and came across a Waffle House, my best guess is that they'd be so busy assimilating waffles and chili-covered hash browns, they'd never get around to exterminating the human race at all. And when they had sated themselves, they'd wobble away on their spindly, green little legs shouting "OOP! BLOOP! QUARK! FLEEGAMATRONICS!" That's space-invader speak for "I love you, man!" "Y'all come back!" the gal at the register would reply with a friendly wave goodbye. NOPE, nothing can turn out the lights at Waffle House. Well, except for one thing: the long arm of the law. Baton Rouge, La., police were not amused -- well, maybe they were a little -- to find the lights on and a party going on at one Waffle House late into the Isaac-tossed night after a 6 p.m. to 6 a.m. curfew took effect Wednesday. The streets were bare through most of the city, but it was like a party at the Waffle House on College Drive. "Four o'clock this afternoon, you could hardly get in the door it was so busy," said Karl Landry. "It was packed. Matter of fact, the waitress told me they had to lock the doors at 5:00 to be able to clean up." It was one of just a handful of places open as Isaac's winds and rain lashed the Capital City, which is why Karl Landry visited the restaurant three times Wednesday. "We're here for the food," said Leah Couvillion. "Our power is currently out, so the air conditioning and the nice break to have some food and to get together is really nice." "I'm very appreciative to Waffle House for being the only thing in town that's open," added another customer. However, there was one problem. With the curfew still in place, the restaurant was not supposed to be open. "I'm sorry, they're closed," an officer said. "We're under a curfew for the town, so I'm going to have to ask you to go home." The curfew is in effect until till 6 a.m., so officers with the Baton Rouge Police Department spent the night making their rounds and forcing shops to shut down, sending employees and potential customers home. "No one told us, so we came here and they told us and we were like, 'Oops,'" said one customer forced to leave. "It's pretty devastating. I'll be honest. I mean, it wasn't that serious of a storm, so we thought Waffle House would be open serving us hash browns," Couvillion added. HERE'S A TIP for corporate: It's Louisiana, y'all. I reckon that if a cute and buxom waitress had waved a plate of scattered, covered and smothered in front of the local constabulary, Baton Rouge's finest might not have actually failed to enforce curfew, but I bet they would have taken their sweet time about it. Just as soon as they'd finished off a late supper at a Southern institution. And a couple or three cups of coffee.